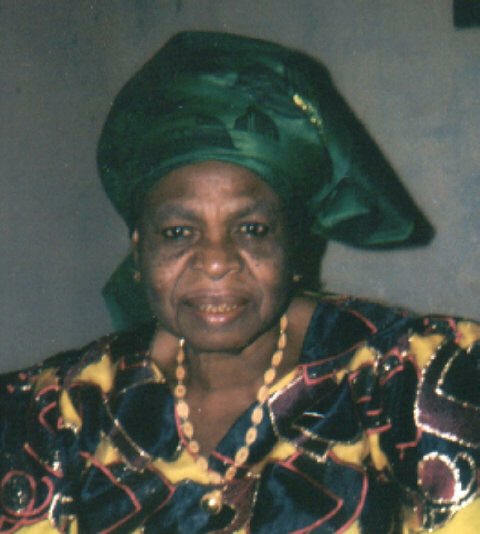 Hannah Egwuime Azuonye was born on March 24, 1928, to the Reverend Pastor Albert Nwosu Igbo (ogbu-anu-ukwu) and Madam Agnes Mgbafoocha of Ndi-Ukwu, Arondizuogu. She was born at Igede in present-day Benue State of Nigeria where she grew up with her elder brother, the late Chief Samuel Okoronkwo Nwosu-Igbo (Ogbukiiyi) and immediate younger brother, the late Uche Francis Nwosu-Igbo. At Igede and elsewhere in the Benue State, especially Oturukpo and Utongkong, her father Pastor Igbo, was one of the most energetic and accomplished indigenous missionaries of the day. With a gift of language and literary creativity, which he passed on to his children and grandchildren and subsequent generations, Pastor Igbo translated the Gospel According to St Luke as well as several hymns from the Methodist Hymn Book and prayers from the book of Common Prayers into the Igede language. Transferred to Oturkpo and elsewhere in the Benue river basin as well as to Oron, Item, Isuikwuato and Okigwe (where he finally settled to a cottage of his own), his wide ranging exposure to diverse Nigerian cultures and peoples, enabled Hannah, like her siblings, to acquire mother tongue competence in several Nigerian languages. Today, Hannah spoke, in addition to her local Igbo and English, five Nigerian languages, to wit Igede, Idoma, Oron, Ibibio and Efik. An artist whose drawing books inspired creativity among her children, Hannah was one of the earliest students of Ovim Girls School where she came under the inspiring leadership of her Irish principal, Miss Spence, to whom she owed her organizing abilities. As she recollected, Miss Spence stressed the value of domestic arts and of selfless service to one’s own community. Like other “modern” ladies of her colonial generation, she was sent for training in the domestic arts immediately after graduating from Ovim, where she passed standard six with distinction. There she learnt sewing, knitting, baking and housekeeping, arts which were to provide her with a base for running a modern family but also an alternative support base as seamstress and baker. In 1944, she wedded Stephen Onyemaechi Azuonye, with whom her family had crossed paths at Oturkpo and in his home town, Isuikwuato, where her father served as a pastor. After the wedding, the couple settled down in a small bungalow in the heart of Okigwe Township where most of their children were born. While Stephen served successively as the colonial Supervisor of Native Treasuries, Treasurer of the Okigwe Northern County Council, Provincial examiner of Accounts, and Senior Examiner of Accounts in the Ministry of Local Government at Enugu from where he retired in 1972, Hannah engaged in a wide diversity of voluntary women’s organizational activities in addition to her primary vocation as a seamstress and small businesswoman. These activities ranged from a long career as secretary of Methodist Women’s Fellowship and activism in organizing the women’s wing of the NCNC and its successor, NPP. She came to political limelight when in 1954, she was selected to be the hostess of the NCNC leader, Dr Nnamdi Azikiwe, during his visit to Okigwe, in his campaign for Eastern Nigerian self-government. From 1979 to 1983, she served as one of the leaders of the women’s wing of the Nigerian People’s Party in the Isuikwuato/Okigwe Local Government Area. Thereafter, she retired to a quiet rural life at the family home in Mgbelu Umunnekwu Isuikwuato but where as Matriarch of the Azuonye Ojinkeyaemeaku family she continued to be active in the organization of local women’s cultural and self-help activities as well as in the organization of support bases for the Methodist Church where she was a Lay Preacher travelling the to various locations across Isuikwuato to as a stand-in wherever and whenever an ordained priest could not make it to hold the church service. At the Mgbelu Umunnekwu Chapter of The Methodist Church, she was also the President of Otu Ihunanya “Society of Peace” one of the two women’s societies in the church, the other being Out Oganihu “Society for Progress”. Most recently in 2006, she was among the few selected women given the special award for exemplary motherhood, Ezinne. Her other titles include Osodiamamba (Literary she who follows her husband to know a foreign land – referencing the fact that she was not native to Isuikwuato), Igirigi Ututu (Morning Dew), and Nnekeeze (double entendre for Nneke eze(nwanyi), “the true queen” and nne ka eze, “mother that is greater than a king”). Fondly known as Ada Igbo, as the first daughter of the Igbo family in Ndi-Ukwu Arondizuogu, Hannah was well-known for her indomitable spirit in the pursuit of every social goal she ever set for herself, for her unfailing generosity and love for family, friends and perfect strangers, and for her self-sacrificing devotion to the moral, ethical and practical upbringing of her children. Her unfailing sense of direction is reflected in her legacy of blood and example to her nine children, who, under her wings have emerged as university professor, medical doctor, technologist, architect, lawyer, fine artist, or theatre professional, and grand children with similar professional diversity and artistic creativity.